Habermas expressed interest in the topic, but declined, explaining that he didn’t think he would have to time to write an adequate paper on the subject. But he indicated that he would be in the Boston area (where he would deliver the lectures that would eventually become The Philosophical Discourse of Modernity) during the autumn of 1984 and would be able to serve as a commentator or discussant. Foucault thanked me for the invitation, explained that Kant’s article had “long been of interest” to him, and indicated he had “begun an study on the subject.” But he went on to say that though he would have liked to speak on the topic, “unfortunately the state of my health is not very good.” At this point, I was unaware that plans were already underway in Berkeley for a more ambitious discussion of Kant’s article involving Habermas, Foucault, Hubert Dreyfus, Charles Taylor, and Richard Rorty. Nor, at that point, was the seriousness of Foucault’s “état de santé” apparent to those of us who do did not have the good fortune to have known him. The Berkeley conference, scheduled for the autumn of 1984, never took place: Foucault died on June 25, 1984. He was, however, able to give a lecture on Kant’s essay (a lecture that Paul Rabinow beautifully characterized as “a kind of gift to Berkeley”). It was subsequently published in The Foucault Reader. There has been much written about this remarkably rich text. And there remains more to be said: it is perhaps the only discussion of Kant’s essay that is its equal. I’m not sure that I have much to add to what has been already been written. But there are some questions about the text that strike me as worth exploring, beginning with the context that gave rise to it. The absence of an actual colloquy involving Foucault and Habermas has not prevented the emergence, some three decades later, of a large body of literature on what has come to be known as the “Foucault/Habermas Debate.” That there was something amiss about the debate that never was (for the sake of brevity, let’s designate this from now on as the “DtNW”) was already apparent in the subtitle of one of the earliest collections devoted to it: Michael Kelly’s Critique and Power: Recasting the Foucault/Habermas Debate (Cambridge: MIT Press, 1984), which — ten years after the DtNW — indicated that it was already in need of reconfiguring. It seems like we’ve been “recasting” it at regular intervals ever since. Do we really need to rehash the so-called Foucault–Habermas debate? Is there really anything left to be said, after so many years and so many articles, which so often quote so many of the same lines? I think, in fact, there is, because it seems to me that what is at issue in the debate – or, rather, what ought to be at issue, given the positions held by the two figures at issue – has never been clearly explicated. In reframing the DtNW in this way, King continues a line of interpretation that was initiated in a flurry of criticisms of Foucault’s work dating from the late 1970s that were subsequently taken up by Habermas in the discussion of Foucault that was first sketched in the 1983-1984 lectures that eventually became The Philosophical Discourse of Modernity. Drawing on Barry Allen’s discussion in Jeremy Moss’s The Later Foucault, King sees this critique as arriving in “three waves” (the fact that, ever since Plato, it has been customary for waves always to come in threes makes me wonder whether there might have been a lost dialogue between Socrates and an Athenian surfer). Certain writers have refused Habermas’ terms of engagement and suggested that Foucault’s critical tools be turned on the very idea of normative foundations. These writers agree with Habermas that the nature of Foucault’s work is such that it could not have any normative foundations. no formal exchange of ideas between Foucault and Habermas ever occurred; instead, what is commonly known as the Foucault/Habermas debate is largely a product of the secondary literature on these two thinkers. Like King, she goes on to argue the debate was not quite the “non-event” that it initially appears to be (let’s face it: journals tend not to be interested in articles that are content to argue “Nothing to see here folks, move along”). But where King tends to frame the terms of the debate more or less the way that Habermas saw it (i.e., as a question about normative grounding), Allen tends to approach it from Foucault’s side, focusing on what the exchange might teach us about the process of “subjectivation.”6 In Allen’s view, seeing Foucault and Habermas as both involved in an attempt to clarify what is involved in the shaping of subjects allows for a productive dialogue between “Foucault and Habermas’s broader philosophical projects,” since an adequate account of the process of subjectivation “necessarily entails both communicative rationality and power relationships” (4-5). While the efforts by King, Allen, and others to extract something useful from the DtNW have much to recommend them, there remains a more basic problem that appears to have dogged the affair (or, if you prefer, nonaffair) from the start. Michael Kelly did a nice job of flagging it at the start of the brief introduction to Critique and Power, but it seems to have been overlooked in the discussions that followed, both in his collection (and I would include the essay that Tom Wartenberg and I contributed to it in this judgment) and in the various essays that have appeared over the last twenty years. Rereading the documents that Kelly collected, I realized for the first time the extent to which neither Foucault nor Habermas seem to have been clear about what exactly the point of their discussing Kant’s essay was supposed to be (obviously, this was clear to Kelly from the start — sometimes my obtuseness amazes me). While this confusion is hardly as theoretically weighty as the various issues that have come to be seen as central to the DtNW, it is not insignificant for those who share my peculiar obsession with Kant’s response to the question What is Enlightenment?￼ and its implications.7 After all, hobby-horses, like waves, are there to be ridden. What Did Habermas and Foucault Think They Were Going to Discuss? The best-known discussion of what the DtNW was supposed to be about was offered by Habermas in the brief eulogy that appeared a few weeks after Foucault’s death. I met Foucault only in 1983, and perhaps I did not understand him well. 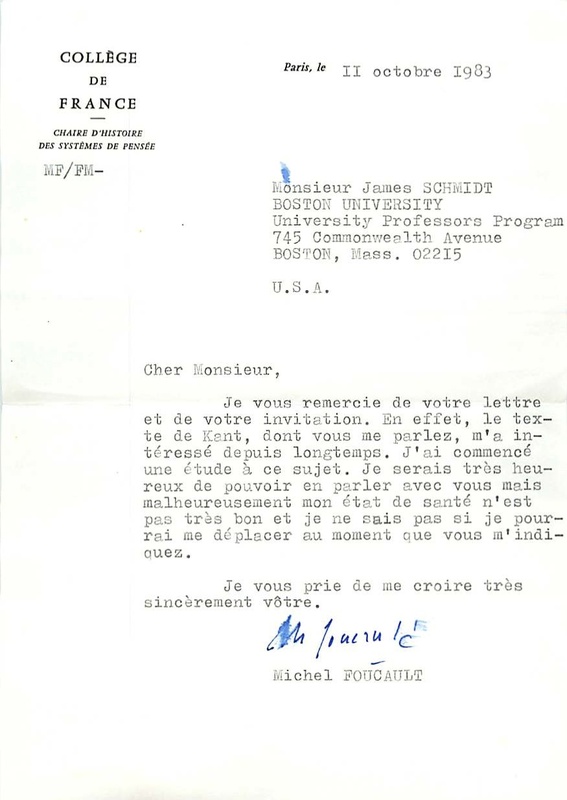 … When he suggested to me in March 1983 that we meet with some American colleagues in November 1984 for a private conference to discuss Kant’s essay What Is Enlightenment?, which had appeared two hundred years earlier, I knew nothing of a lecture on that very subject that Foucault had just given. I had understood his invitation as a call to a discussion in which we, along with Hubert Dreyfus, Richard Rorty, and Charles Taylor, would debate various interpretations of modernity, using as a basis for discussion a text that in a certain sense initiated the philosophical discourse of modernity. But this was not exactly Foucault’s intention in his proposal; I realized that, however only in May of this year, when an excerpt from Foucault’s lecture was published (Kelly 149-150). What we have here is a somewhat different account of the origins of the DtNW. There is no suggestion that the seminar will focus on Kant’s answer to the question “What is Enlightenment?” (Though, of course, it is clear that Foucault has a longstanding interest in the text). Confusions of this sort are, of course, hardly unusual, especially when we are dealing with scholars with as many demands on their time as Foucault and Habermas. Indeed, even those of us at the lower levels of the academic food chain are usually not entirely clear what we have agreed to talk about when someone invites us to talk about something until we have actually written the damned thing (a process that, in at least some cases, is completed in a state approaching panic on the way to the scene of the crime). But, obsessed as I am with the long history of the question “What is Enlightenment?”, it might be useful to achieve some degree of clarity about how the DtNW developed in the year or so between the meeting between Habermas and Foucault in Paris in March 1983 and Foucault’s death in June 1984. Unfortunately, there is a paper that I need to write for a talk that I am supposed to give at the end of August and (more importantly) the Clover-brewed Starbuck’s Reserve that has been fueling me as I write is now but a pleasant memory. So, it is time to schedule this post for publication (6 AM on Wednesday morning seems like as good a time as any), and continue the discussion next week. But if any readers have any light to shed on the Debate that Never Was, I would be deeply indebted. The comments section is open for business. This entry was posted in Uncategorized and tagged Foucault, Habermas. Bookmark the permalink. Thanks for the additional comments. Now that I’ve got Part II posted (it took a bit longer than I would have liked to get it up), perhaps I can say something sensible about your comment, which is quite helpful and, indeed, probably influenced some of what I wrote in Part II. If we knew more about the plans for the Berkeley meeting, it might be possible to determine how it would have mapped onto your distinction between “debates” or a “dialogues.” I suspect that what I may have had in mind, when I wrote to Foucault and Habermas (and also to Derrida — I have a letter from him lying around somewhere), was something more along the lines of a sort of public “debate” (I’m not proud of this, but there you are — I was young and ambitious and had some money from my unit to spend): a series of presentations by thinkers who I assumed would have radically different takes on what Kant was saying. I suspect the result would have been splashy but not terribly edifying (these sorts of things rarely are). That Habermas speaks of Foucault having invited him to a sort of “private conference” with a few others suggests that the people at Berkeley had a more sensible idea and one that might have eventually produced some interesting papers. But I’ve not had much luck in tracking down any solid information as to what was being proposed, how the event was going to be conducted, etc. Paul Rabinow’s 2011 book The Accompaniment includes two fine chapters on why Berkeley mattered to Foucault (I’d like to quote from it in a future post — it’s an important corrective to certain other accounts of Foucault’s time in California — and the April 1983 interview that he published in the Foucault Reader entitled “Politics and Ethics” (pp. 373-380) is intriguing but also somewhat maddening (but in a good way). It is described as an “edited version of interviews conducted with Michel Foucault in Berkeley, in April 1983, by Paul Rabinow, Charles Taylor, Martin Jay, Richard Rorty, and Leo Lowenthal.” So, here we have two of the proposed participants in the “What is Enlightenment?” discussions (Taylor and Rorty) along with a member of the earlier Frankfurt School (Lowenthal) and the leading American scholar of that tradition (Jay). They are also reduced to a single, anonymous “questioner” (denoted “Q.”), but it is intriguing to guess who is asking what and to try to map out the different investments that are in play. If a complete recording of the interview survives somewhere, it would certainly be worth transcribing it and having it made available (perhaps it has — it’s been a while since I checked the Berkeley holdings). It might provide the best evidence about what the discussion might have involved. Whether the conference could have provided a space of emergence for an actual dialogue would depend, as you suggest, on how close Habermas and Foucault might have come to understanding each others’ positions. As I’ve tried to argue in Part II, it strikes me that what Habermas is doing is attempting to re-describe what Foucault was up to in his own terms (he does this in his discussions of other thinkers as well — I have some reservations about readings of this sort, but then I’m not trying to do what he was attempting to do). The risk here, of course, is that differences tend to be glossed over (I’ll be flagging a few of them in the third part). I’m still not quite sure about how to interpret some of Foucault’s moves. For example, just what should we make of the fact that in January 1983 — i.e., before Habermas delivers his lectures at the Collège de France — Foucault describes Kant’s answer to the question “What is Enlightenment?” as a “discourse of and about modernity”? It can’t be a nod and a wink to Habermas, because the lectures that would become The Philosophical Discourse of Modernity have yet to be given (but might Foucault have been in a position to know the title of Habermas’ upcoming lectures?). And what is Foucault — who had expressed a certain distaste for the concept of “modernity” in an interview from around this same time — doing using the term “modernity” at all? There’s a lot to puzzle out here, so thanks for the help. I need it! Sure. What I was trying to get at with the distinction between “dialogue” and “debate” is the difference between a conscious, mutually-agreed upon engagement between two people upholding particular positions (i.e., debate), and what seems to me a much more diffuse encounter that inevitably involves some degree of “talking past one another” (i.e., dialogue). Since there never was an intentional, face to face encounter initiated by the parties, these terms function largely as metaphors for understanding their interactions. I call it a “dialogue,” though, to indicate that each man’s statements were created at least in the vicinity of the other’s, and could be profitably compared. It certainly seems like this moment has attracted this kind of notice because commentators could not resist this kind of reading of the moment. What do you think of that formulation? I suppose we could say that Habermas made an effort to engage Foucault’s work in Philosophical Discourse of Modernity and that, ever since its publication, there have been a variety of efforts to respond to the particular set of concerns that he raised. But we do not, of course, have Foucault’s response to this account, which makes the “Foucault/Habermas Debate” rather different from Habermas’ previous engagements with Gadamer or Luhmann. The problem may be that I’m not understanding the difference that you’re seeing between “dialogue” and “debate.” Could you say a bit more on this? Hi James, beautiful post. One way to describe this is is as an unwitting collaboration between two authors with very disparate views, so that it felt to both men as if they hadn’t fully “translated” or understood each other’s views quite enough. Is it possible to talk about the intentionality of a debate like this, since what we have exceeds what either participant understood himself as doing? In some sense, it might be better to frame this as a “dialogue,” since what feels really at question here is the degree to which the interlocutors engaged/wished to engage with each other’s arguments. But I agree that seeing this as a kind of rhetorical competition between the two feels significantly misleading.